Another reason I didn’t play this at the time is because I hadn’t seen the LOTR movies as of yet (I know, I know, I’ve seen them since, back off), so I didn’t have the connection to foster much interest in playing the game there either. I seen people call this game one of the last great RTS games, and it really seems to have come along right before the genre saw a significant downswing in releases (something akin to our beloved space games). If that’s the case, then it does well for itself by taking what works for the RTS genre and mixing in the well-known style and flavor of the LOTR universe into what seems to be a damned compelling RTS title. The game has several modes, such as a tutorial, skirmish, two campaigns (good and evil) and the big War of the Ring mode, which is the game’s strategic/tactical mode thingy. So far I’ve dived into the tutorial, done some of the good campaign and played some skirmish maps (I want to get a good feel for the game before diving into the War mode). If you guys haven’t played this game, and like RTS games at all, lemme tell ya this one is a beauty. I don’t just mean that visually either (though the game does look great even eight years later). This game reminds me a lot of Freespace 2 in its own way. It’s a refinement of a well-known formula into an even better all-around end product. The game just FEELS right. The combat is visceral and satisfying, the sound effects are fantastic (as is the voice acting, helped along by the amazing Hugo Weaving), the more mundane aspects of RTS games such as construction are well streamlined and the interface is just fantastic. There are also a lot of units to play with, heroes, powers and so on. I plan on playing this one for a while, through both campaigns and the expansive War of the Ring mode, as this is a damned fine game and one I’m kicking myself for not having played earlier. Have you guys played this one at all, or are there any other types of similar strategic/tactical games like this y’all enjoy? I’d love to learn about more I might’ve missed if so. :) Thanks for reading my little rant, and have a great day! Well, you got this right for sure. Anytime a new RTS comes out, I secretly hope it took a page from either this or Rise of Legends. Haven’t seen anyone do entire battalions gettings stomped this well since Black and White 2. If the combat seems unbalanced, keep in mind that it’s only polished by the end of the base game. RotWK decided to make every faction more viable by adding wacky niche units. 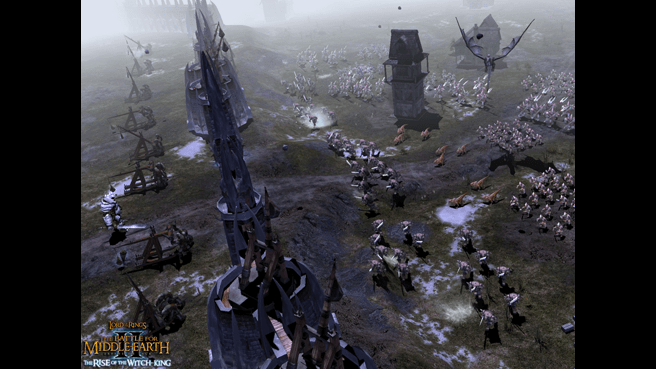 Cavalry immune to spear walls(but then are garbage in combat), caster units that will not survive one volley, summoning units during battle and other such silliness. It’s a shame this isn’t digitally distrubuted. If you don’t have $60+(just the expansion!) to throw at eBay, you must resort to piracy. EA actually was selling this for a short while, but when they switched to Origin from their old browser-based store…they just didn’t bother moving this. Rise of Legends huh? That’s also one I own but have yet to play? Should I fire it up? Well, in addition to having one of the tightest control schemes and most informative UI I’ve seen in any RTS, the actual gameplay is the some of the most fun to watch. Similiar to BfME2, it allows command of entire units, rather than individual dudes. To that effect, the huge clockwork golems will stomp line infantry and kick individual men out of formation. Dragons will divebomb enemy lines and take a chunk out of defensive lines. To prevent being overwhelmed by huge numbers of crossbowmen, you can force command your magitek creatures with non-AOE weapons to use their “trample” attack instead of the default. You get the idea. The campaign is pretty fun as well, if you’re into that. The story is mediocre, but there’s a persistent unit and hero upgrade system, so there’s a bit of replayability. I really dug the physics based approach to combat, even if it wasnt physics based at all. But at least it made sense with the spearmen, the riders and the swordmen. I found the heroes a bit unbalanced in one of the games (cant remember if it was 1 or two), and I really liked the create your own hero / supervillain thing! You should absolutely be playing Rise of Legends. It is quite creative and good.